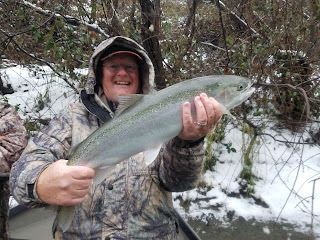 Umpqua River Fishing - Klamath River FishingThe last couple of weeks have been hit or miss for the start of winter steelhead season. The heavy snow and rain has kept the rivers up and this is limiting the number of fishing days anglers and guides are getting in. We have been bouncing around chasing green water and chrome rockets on the Klamath, Umpqua, Chetco, and Coquille river systems. Consistently the Klamath River fishing has been a little better than most rivers with days ending in double digit adult steelhead catches and a bunch of half pounders to help pass the time. Klamath River Fishing Guide Rob and Ethan timed getting some Klamath River fishing in just right and was able to get 2 good days in before the river blew out again. They fished with Mario Gomez of Ironhead Guide Service and put 43 fish to hand (WOW). The water was big and the fish were hungry. They were eager to take a side drifted yarn and egg presentation, and the big fish were not afraid of annihilating a plug.